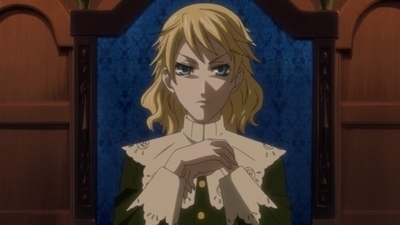 [show all]Ciel is informed that the abandoned Ludlow Castle that his estate owns is haunted by ghosts and the workers are too spooked to continue remodeling it into a hotel, so he and Sebastian head to the castle to investigate. There they encounter the ghosts of two princes who were assassinated four centuries ago, Edward V and his brother, Richard. Ciel plays a game of chess against Edward V to pass the night, but he loses and Edward claims Sebastian as his winnings. Alone, Ciel solves the mystery behind the princes. The ghosts of Edward V and Richard thank Ciel and Sebastian before departing for the afterlife, and the remodeling of Ludlow Castle resumes.